Premier independent festival producer Danny Wimmer Presents continues to show its love for Louisville with a third addition to a massive fall festival series in the one-of-a-kind city. “Hometown Rising”, the first-ever Country Music & Bourbon Festival, will make its debut Saturday, September 14th and Sunday, September 15th at Highland Festival Grounds at KY Expo Center, combining two of Louisville’s cultural cornerstones…great music and incredible bourbon. 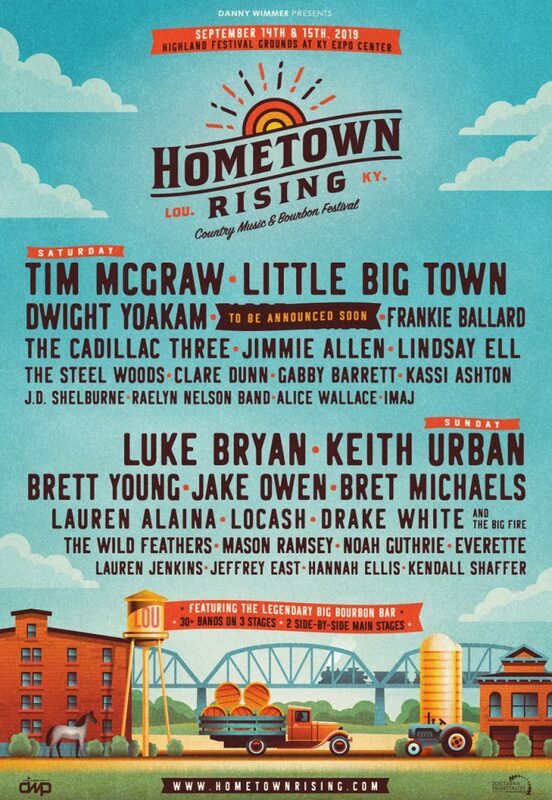 “Hometown Rising’s” incredible music lineup will be led by country heavyweights including Luke Bryan, Tim McGraw, Keith Urban, and Little Big Town with additional appearances from Dwight Yoakam, Brett Young, Jake Owen, Bret Michaels, Frankie Ballard, and many more. In total, more than 30 artists will play on three stages, including two side-by-side main stages, over the course of the weekend. I am beyond thrilled to be playing the very first year of Hometown Rising, and to have the opportunity to be part of such a prestigious and eclectic lineup of modern country artists,” says performer Alice Wallace. “Hometown Rising” exclusive VIP packages, General Admission tickets, camping and hotel packages, as well as special event tickets go on sale Friday, February 15th at 12:00 PM EDT. Hometown Rising is a blend of the music and culture I grew up around, in a place I now consider a second home. While DWP is best known for our rock festivals, I was surrounded by country music growing up in Jacksonville, Florida, and I’m excited to be expanding our portfolio with a genre and a place that are both close to my heart. I can’t think of a better location to launch a country music festival than right here in bourbon country. Mayor Fischer and the Louisville community continue to be great partners as we take this next step in the marriage of great music, food and bourbon,” festival producer Danny Wimmer states. Bourbon authority and best-selling author Fred Minnick is the festival’s official spirits curator and has helped assemble incredible onsite experiences, including bourbon tastings and workshops for fans 21+ during Bourbon Heritage Month. The centerpiece, the legendary Big Bourbon Bar presented by Louisville Courier Journal, will feature more than two dozen hand-selected bourbons from top distilleries, and a unique opportunity to enjoy bourbons and exclusive one-time specialty cocktails. Fred Minnick’s Mini Bar presented by The Bourbon Women Association will showcase craft selections. Acclaimed Louisville whiskey bar The Silver Dollar will operate The Hunter’s Club, where attendees can find vintage bourbons dating as far back as the 1930s, as well as contemporary collectibles. The initial list of participating bourbon brands at Hometown Rising includes Angel’s Envy, Barrell Bourbon, Boone County, Coopers’ Craft, Elijah Craig, Evan Williams, Jim Beam, Knob Creek, Larceny, Maker’s Mark, Old Forester, Woodford Reserve, Four Roses Bourbon and Kentucky Peerless, with many more to be announced. In addition to performances from top music artists, and various onsite attractions, attendees can enjoy a variety of local and regional food and beverage offerings provided by DWP’s affiliate concessionaire, Southern Hospitality Concessions LLC. Festival attendees will be able to experience a taste of Louisville with selections from the following local and regional restaurants…Boss Hog BBQ, Couvillion, Doc Crow’s Southern Smokehouse & Raw Bar, Eli’s BBQ, Heine Brothers Coffee, Hull And Highwater, Joella’s Hot Chicken, Merle’s Whiskey Kitchen, Seviche, and more! “Hometown Rising” is produced by Los Angeles-based Danny Wimmer Presents, one of the largest independent producers of destination rock music festivals in America. DWP events include Aftershock Festival, Bourbon & Beyond, Chicago Open Air, Epicenter Festival, Hometown Rising, Louder Than Life, Sonic Temple Art + Music Festival, and Welcome To Rockville. For more information and tickets for “Hometown Rising”, please visit their website and follow them on Facebook, Instagram and Twitter.